Only a 100 metre walk to Ohope beach - 11km of beach with safe swimming, surfing and enough beach space to make feel like you have the beach to yourself....what more could you ask for? 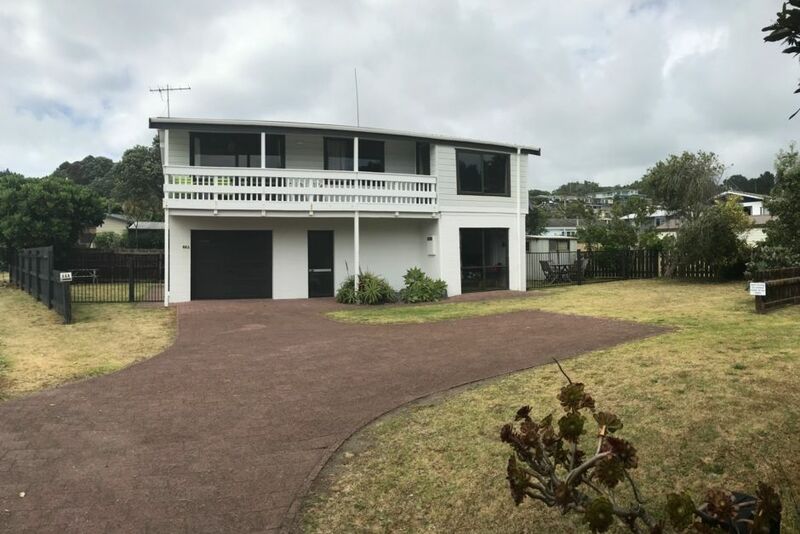 Our 3 bedroom, two storey Lockwood on Ocean Road has a traditional Bach feel to it but has everything you need to have a great stay away from home. The house has 2 bedrooms upstairs with the main living area and bathroom. Downstairs is a self-contained bedroom, with small kitchenette and bathroom (please note, there is no internal access to the upstairs).Great for 2 families or a family with older children who want their own space! We have a large flat section so there is plenty of room for parking, extra tents and for the kids to play. The garage has been converted to a table tennis room for great evening fun. The house is located close to the ocean and a short drive/walk Ohiwa harbour. The back yard is fully fenced to keep your dog safe. A large dog kennel is also provided. In April 2017 we gave the house a makeover to make it even more comfortable for our guests, this included a paint job, new floor coverings, curtains and duvet covers. We have also added free Wi-Fi just in case you can’t leave the office behind or wish to catch up on your favourite Netflix programmes. High season rates include up to 8 people. Quiet and fully fitted out with everything you need to have a relaxing holiday. Clean and tidy had everything we needed. Just over the road and you are at the beach very nice. The property suited us very well and a bonus to be able to bring the dog. Handy to everything, Greg was great to deal with, just book pay done, easy as. House was clean and we didn’t want for anything. A beautiful beach at your doorstep what more could you want. Phil went fishing down at the harbour, no luck with the fish but as the girl in the store said if you don’t catch anything you come back and get your fish and chips here. Very friendly people just a nice relaxing place to stay. Clean and tidy, had all that we required. Across the road from the beach. Lovely and quiet. Room for a bit of cricket and we enjoyed the table tennis. A great bach. Thanks so much for our stay you have a groovy little pad will definitely stay again!!!! Was so nice to be near the beach. Due to go in for an op so was awesome to have the freedom of the beach and spend some quality time with some family. The house had everything I needed. Had some trouble with ants attacking my inhalers and there was some dead bugs in the bath when we arrived otherwise the rest of the property was neat. Spacious and would definitely stay again with family get-together. Close to beach - end of drive, and across the road. All amenities and felt comfortable and clean. Thank you for welcoming people who love to take their dogs away!